This is Michael Lortz’ fourth piece as part of his June residency at FanGraphs. Lortz covers the Tampa Bay baseball market for the appropriately named Tampa Bay Baseball Market and has previously published work in the Community pages, as well. You can find him on Twitter, as well. Read the work of all our residents here. For the sake of determining whether wins matter, that’s way too small of a sample size. Davis might have had enough data points, but his data points were not representative of the wide array of situations with which franchises must contend. In 2012, Dan Lependorf wrote a post for The Hardball Times concerning the relationship between wins, attendance, and payroll. Whereas Davis went deep in time for a few teams, Lependorf analyzed every team from 2000 to 2011. Lependorf concluded that the relationship between wins and attendance produced an R-squared of .27. 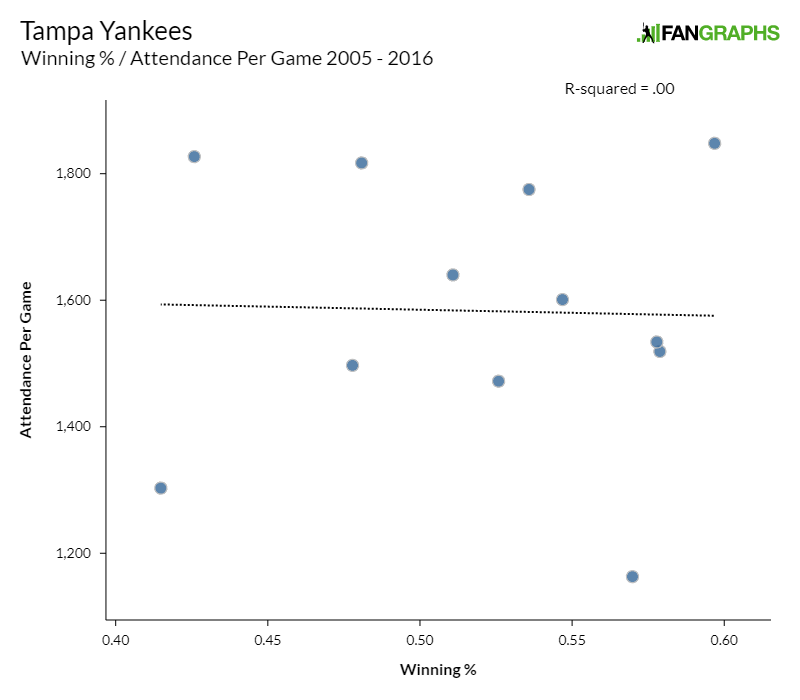 There was an even stronger correlation to attendance and wins the previous season (R-squared = .3). Attendance in a season featured an even stronger relationship to attendance level in the previous season (R-squared = .8). Every sports team in every city will draw at least one fan. In Major League Baseball, we can also guarantee that every team will win at least one game. We can also guarantee a top level of attendance depending on the maximum capacity of the stadium. For the Rays, that would be 40,135 times 81 — or 3,250,935. And, of course, the most wins the Rays can have in the regular season is 162. Since 1999 (excluding their inaugural season), the Rays have averaged 1.4 million fans and 75 wins per season. They’ve had eight seasons over 75 wins and nine seasons over 1.4 million fans. 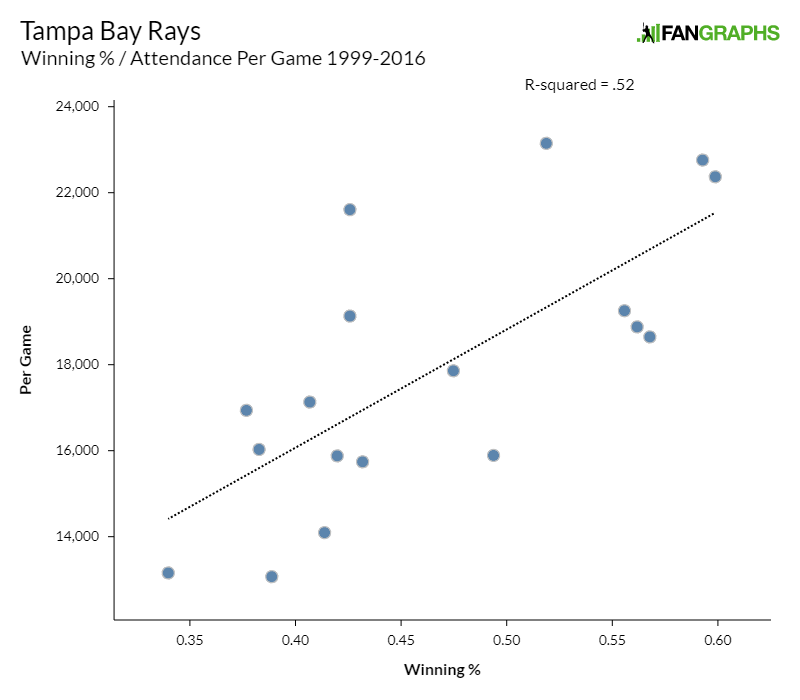 Since 1999, the correlation between the Rays’ winning percentage and attendance per game produces an R-squared value of .52. That is almost double the correlation Davis found for teams. So despite the claims that wins don’t matter to attendance in Tampa Bay, they do. To a point. Since 2008, wins no longer have the same allure for the Rays’ fanbase. 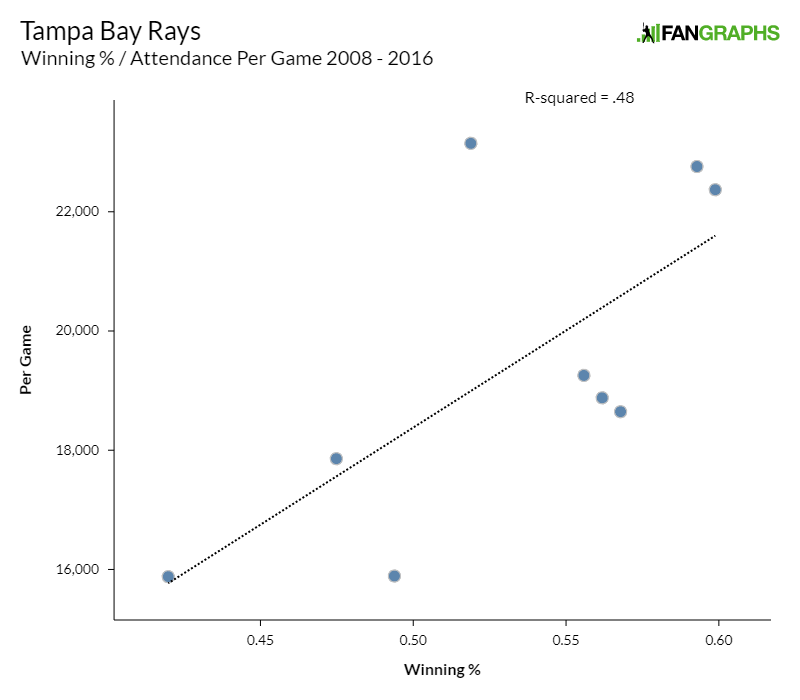 While the population of Tampa Bay has increased, per capita income has increased, the number of jobs has increased, and the team’s television ratings have increased, the correlation between winning percentage and attendance has decreased to an R-squared value of .48. As I’ve written before, the Rays aren’t alone in Tampa Bay. There are several other baseball options. Specifically, there are four minor-league teams playing within 30 miles of Tropicana Field. These four minor-league teams – the Bradenton Marauders, Clearwater Threshers, Dunedin Blue Jays, and Tampa Yankees – have averaged a total attendance of 365,000 fans per year since 2005. They also average 70 wins each in approximately 140 games a year. Tampa Bay-area minor-league teams vary in their correlation between wins and attendance. 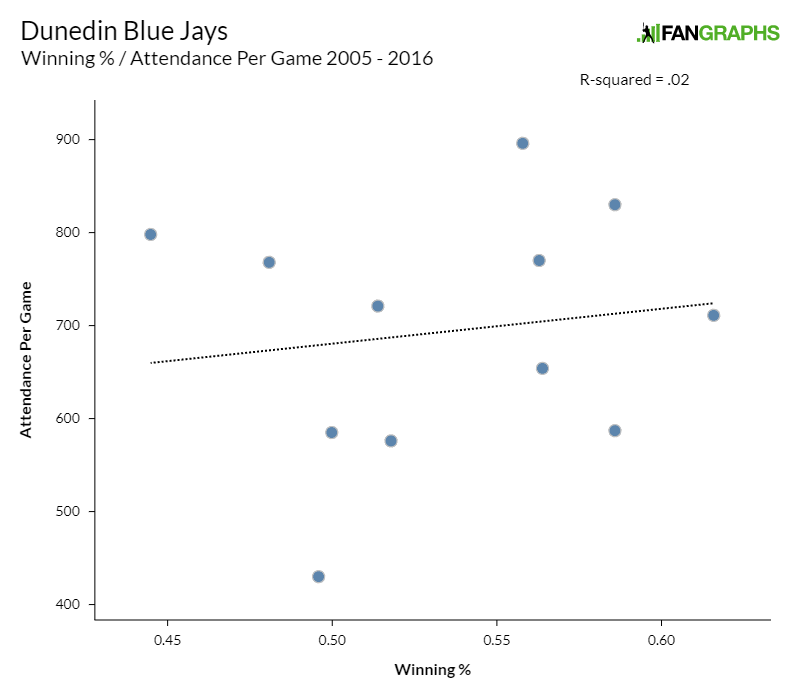 Since 2005, the Tampa Yankees and Dunedin Blue Jays have seen very little change in attendance relative to their success on the field. 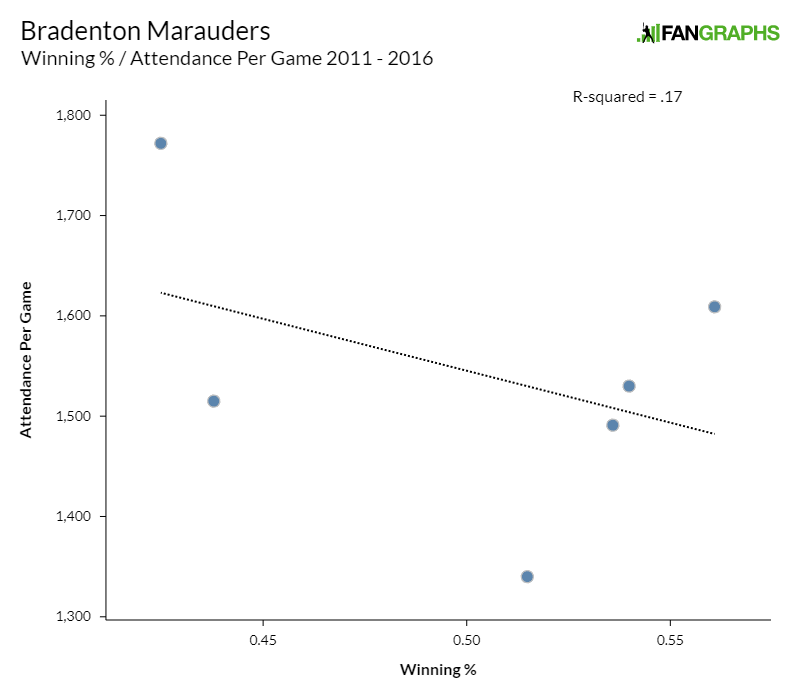 The Bradenton Marauders — albeit with a smaller data set, as they only began play in 2010 — actually so far see a negative correlation between wins and per-game attendance. 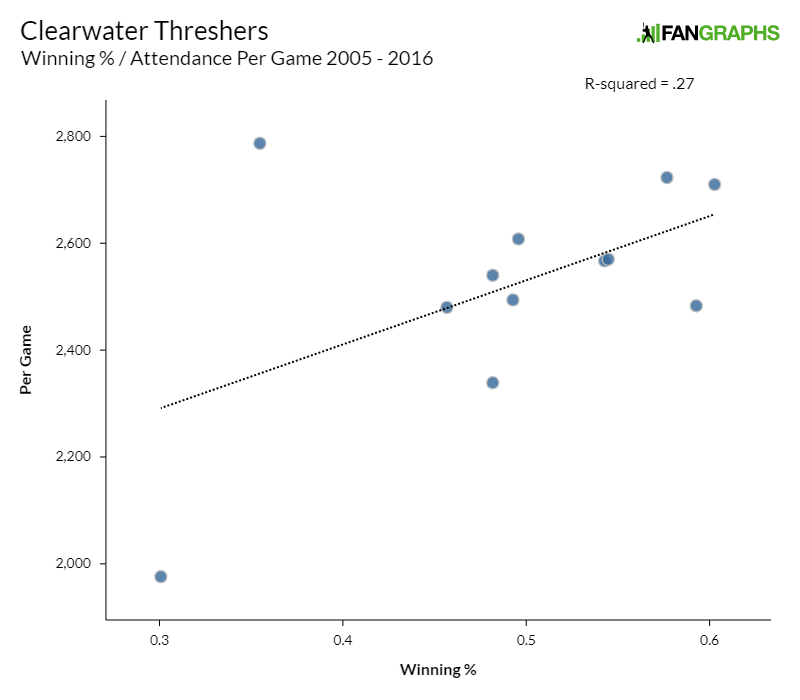 The Clearwater Threshers have a wins-to-attendance correlation very similar to the average Major League team, with one glaring exception. In 2014, the Threshers had a .355 winning percentage, a 49-89 record, and yet challenged the Florida State League attendance record due to a season of highly effective promotions. In order to explain the Threshers’ 2014 season, we have to consider the marketing philosophy of Minor League Baseball. Wins and losses, and even competition, are not the main attraction of Minor League Baseball, at least in the Florida State League. According to former Lakeland Flying Tigers GM Zach Burek, Minor League Baseball is an entertainment business. A winning team in the minor leagues isn’t the source of entertainment. That might be true at the major-league level, especially where rivalries and playoff games are concerned, but at the minor-league level – especially in Tampa Bay – championships matter only for the team, not the ticket buyers. In my interview with Rays President Brian Auld earlier this season, he mentioned the Rays’ need to keep promotions fresh. In my post here a few weeks ago, I looked at the decline in attendance for the Rays’ concert series. 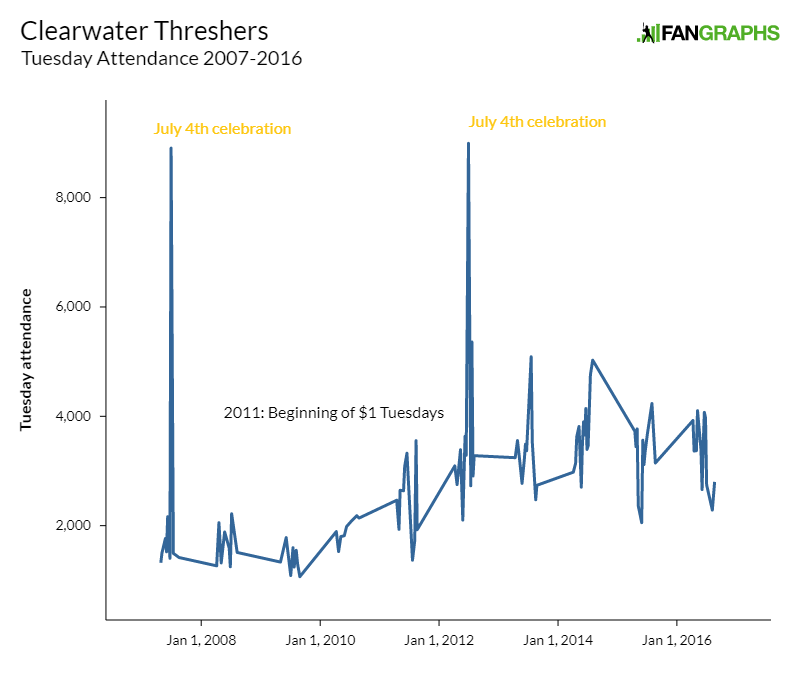 The Rays’ concert series averaged over 30,000 in 2008, but in 2016 struggled to draw 20,000. Minor-league teams also shuffle their promotions every year to win the dollars and interest of local fans. The few exceptional mainstays among the Tampa Bay teams are the ever popular “Thirsty Thursdays” used in Dunedin and Bradenton — and Clearwater’s $1 Tuesday, which has been a very effective promotion since 2011. The Threshers’ $1 Tuesday night has been their most consistent promotion, drawing well over their average attendance every Tuesday. Consider: since 2011, the Threshers’ average Tuesday attendance has been 3,346, while their overall average attendance since 2011 is only 2,660. Meanwhile, the Rays’ $2 Kids Tuesday promotion this season is averaging 13,775 tickets sold per game. Fireworks nights are also consistent draws for Tampa Bay-area minor-league teams, with ticket sales comfortably exceeding each team’s average attendance every season. The biggest fireworks day, of course, is the Independence Day celebration. Due to travel, however, teams sometimes have fireworks spectaculars on July 3rd or 5th. For none of these promotions does winning matter. They are all about the experience, whether eating a dollar hot dog or running around with other kids. The on-field action is irrelevant. While the Rays struggle to find the right mix of promotion, local minor-league teams have much better success, albeit at a smaller level. Which makes the Rays job of marketing and fanbase-building even more difficult. With Tropicana Field’s poor location and less-than-perfect aesthetic, the Rays are beholden to winning and to win often in order to sell tickets. They have to be competitive, to cultivate rivalries, and to secure close, exciting wins. They have to sell a top-flight baseball product that leads to emotional enjoyment upon exiting. It’s much harder to send a fan home happy if the team has to win than if the organization has to provide $1 hot dogs, 2-for-1 margaritas, or free tickets for kids. Individually and on a nightly basis, Minor League Baseball might not matter to Rays attendance. But over the course of the year, the revenue lost to the four local Florida State League teams adds up. Especially when they operate with a different marketing strategy, one that is easier to accomplish. To be fair, the Rays have lowered their price points to be competitive, but they can’t beat the locality, speed of game, weather, kids’ accommodations, promotion values, and low cost of the regional minor-league offerings. Winning matters for the Rays, and they have to do so to survive. We hoped you liked reading What the Rays Can (and Can’t) Learn from Local Minor-League Attendance by Michael Lortz! So if the Rays aren’t going to win they need to move the team to an unsaturated market? The Rays could move to Portland, Oregon and have Anarchist Tuesday, every fan 12 and over gets a balaclava and a can of spray paint. The only problem with that is that almost every male in Portland over 12 years old already has several balaclavas, a large supply of spray paint, and a spiked baseball bat. I certainly think this is part of it. As a longtime Tampa Bay resident, I’ve been to my share of games in town. Within a 60 minute drive of my home I have a major league franchise, five Florida State League teams, and two relatively competitive college teams. If I was willing to drive two hours I have can add three more minor league teams and a summer college bat league to the mix. How many other markets have two teams, in the same league, within a ten minute drive of year other? Also, teams like the Thresher’s capitalize on accessibility and bank on a family trying to stretch their entertainment dollar. The Thresher’s kid club is $20 a year and they get into Tuesday games all year. It isn’t hard for a family of four to enjoy a night of baseball for less than $50. Why drive 45 minutes to the Trop and drop way more cash when you can go to the Thresher’s stadium in 10 and have a great, less expensive experience? Its hard to compete with that. Where I live it’s very hard for a family of one to enjoy a night of baseball for $50.